Ahmed is from Kabul, Afghanistan, and is a medical doctor by training. Despite the challenges of living under the Taliban regime, Ahmed graduated with a medical degree from Kabul Medical University in 2004. “While I was in medical school I always had a passion to better serve the people in my community and I put a lot of effort into achieving this goal.” Unfortunately Ahmed’s dream of practicing medicine was cut short because of the political turmoil in his country. Fluent in Pashto, Dari, and English, he was hired to interpret for the military. For ten years, he worked in various capacities ranging from Head of Clinic for the Afghan Ministry of Public Health, interpreter, medical translator, and Team Leader/Work Flow Manager for SOS International in Kabul. During this time, Ahmed accepted a job interpreting for the US military. He didn’t know that ten years later, he would have to say goodbye to his parents, nine siblings and close friends to board a plane for the US with his wife and three children. Ahmed has not seen his family and friends since. His life would be in grave danger if he were to return to his country. As a US Military Interpreter and Translator, Ahmed and his family were issued Special Immigrant Visas. These visas are granted to individuals who worked for or on behalf of the US government in Afghanistan and experienced ongoing serious threats as a result of their employment. 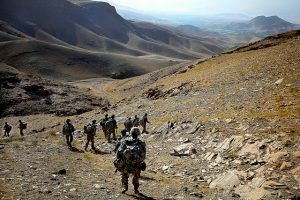 The Taliban and local insurgents targeted interpreters because of their close relationships with the US military. Today there are at least 1600 interpreters from Afghanistan and 6000 from Iraq who live in the US. When Ahmed first arrived in Portland, he admitted, “I was lost. You don’t know how to get around. I had a lot to figure out. I realized the fact that entering the medical profession in the US is going to be challenging.” But Ahmed was clear about his short-term and long-term goals. His short-term goal was to get a job and his long-term goal was to become a Physician Assistant. Since then, Ahmed has graduated, been certified and is working as a Physician Assistant. SMI is humbled by Ahmed’s determination and perseverance. We congratulate him on reaching his goals!